The BBC is devoting a whole day of programmes relating to the FA Cup on Cup Final Day, with special editions of Saturday Kitchen, MOTD Kickabout, Pointless and live coverage of the actual match - Arsenal v Aston Villa - from 17:15 (kick-off 17:30). 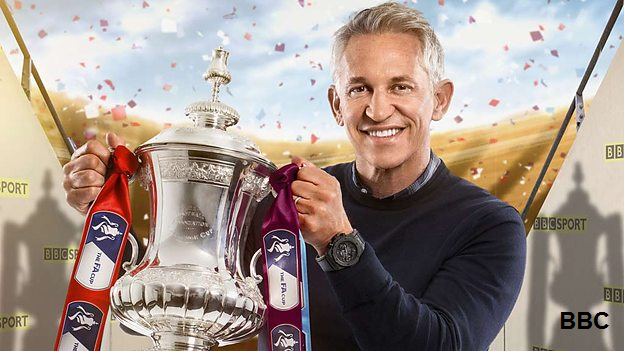 The special day of programming on Saturday 30th May 2015 is the culmination of FA Cup themed programmes on the BBC, which will include Gary Lineker presenting Have I Got News For You (Fri 29, 2100 BBC One), an FA Cup themed Clare Balding Show (Fri 29, 2200, BBC Two). Fans travelling to Wembley from Birmingham are also in for a treat as legendary commentator John Motson takes over some train announcements throughout the morning, advising passengers on the next stop coming up as well as the buffet cart opening times. On Saturday, BBC Breakfast (0630-1000, BBC One) start the anticipation on TV with live reports from Wembley, bringing the early morning buzz of Cup Final day. Following this, Saturday Kitchen (1000-1130 BBC One) will give their own FA Cup twist to the popular food show. BBC Two there’s the chance to relive a classic final of yesteryear in FA Cup Rewind (08:30-09:30) alongside a special edition of the children’s show MOTD Kickabout (09:30-10:00) and another chance to see Rio Ferdinand and Helen Skelton present the FA Cup 50 Greatest Moments (10:00-12:00). BBC Sport takes over BBC One with Football Focus (12:10-13:00) which sees presenter Dan Walker giving a unique perspective of Wembley Stadium as he become the first Sports presenter to climb the famous Wembley arch. Mark Radcliffe presents a special football-themed edition of TOTP2 with all the classic Cup Final songs and there’s another chance to see documentaries Gary Lineker on the Road to FA Cup Glory, The Road to Wembley and the popular FA Cup edition of quiz show Pointless at 14:30. Gary Lineker and guests including Alan Shearer and Dion Dublin then start the build-up to the main event (from 15:55) as current holders Arsenal take on Aston Villa at the famous Wembley Stadium. Sixty-four members of the Songs of Praise FA Cup Fans Choir will provide a different twist to the traditional pre-match song Abide With Me, before the match kicks off at 17:30. Mark Pougatch is live from Wembley for 5 live Sport on Radio 5 live. Mark and guests will be bringing all the colour and atmosphere from midday before John Murray, Alan Green and Chris Waddle commentate live on what will be the 134th FA Cup Final. Clearly it has not occured to the BBC that there are people who would rather watch paint dry than football. Like myself for example. What are we supposed to do during this week of wall to wall football?